I have officially passed the 300th post on this blog! (322 to be exact) I also had a two-year blog anniversary (last November). I would like to celebrate YOU, the wonderful blogging and sewing friends I have connected with through this blog. I have been finding my way over those past two years, blogging about my passions in life, making connections, building a network. I love to share my sewing and art projects, and I appreciate getting such great feedback from all of you. In the midst of my favorite things, I’ve had fun talking with you about baking, gardening, outdoor adventures, and travels. I was thinking someone out there might want this mini quilt I made especially for this giveaway. 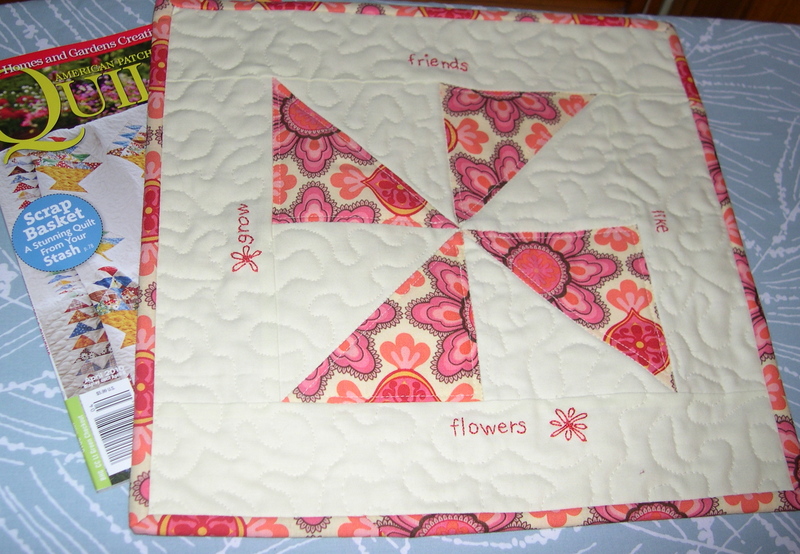 I used two lovely fabrics I got from Randi, and Dana’s instructions for making one pinwheel block. I put a cream border around it, and embroidered this saying “grow friends like flowers” around the block. It measures approximately a 13-inch square. Quilted, bound, and ready for delivery to your house! Leave a comment here by Saturday, March 27 at 10:00 p.m. CST to be entered into my giveaway. Feel free to spread the word, if you want to. I will announce the winner on Sunday, March 28. Thank you for being my friends! this is just so CUTE! would love to win! I really like that. You seem to get so much done and everything is so nice. You are my inspiration. Keep it up. Congratulations on all of your milestones! It’s been wonderful getting to know you over time 🙂 This quilt is adorable, love the embroidery. Congratulations on your 322nd post. Just love how you have written this post. 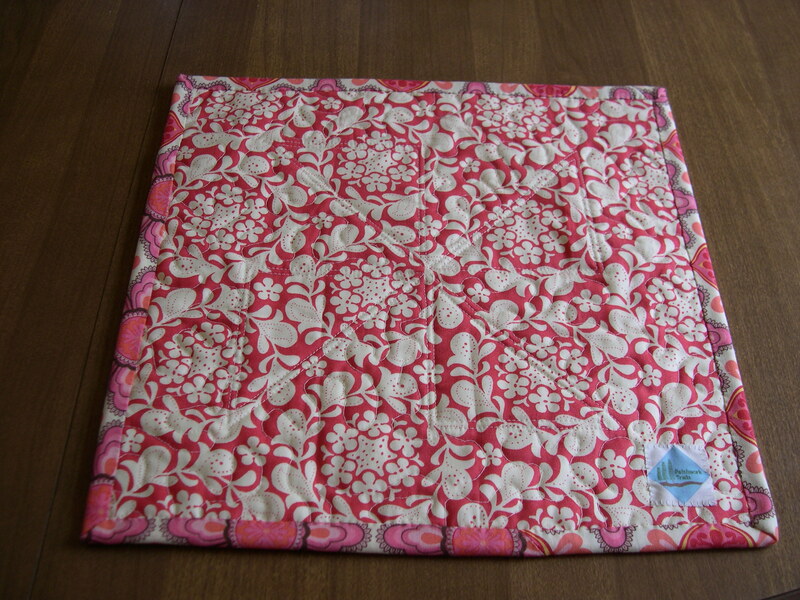 I am sure whoever wins your lovely mini quilt will love it to pieces. It is most welcome to come to my home!! Happy days. Congratulations on over 300 posts! I always enjoy stopping by to see what you have been up to! I look forward to lots more inspiration from you in the future. 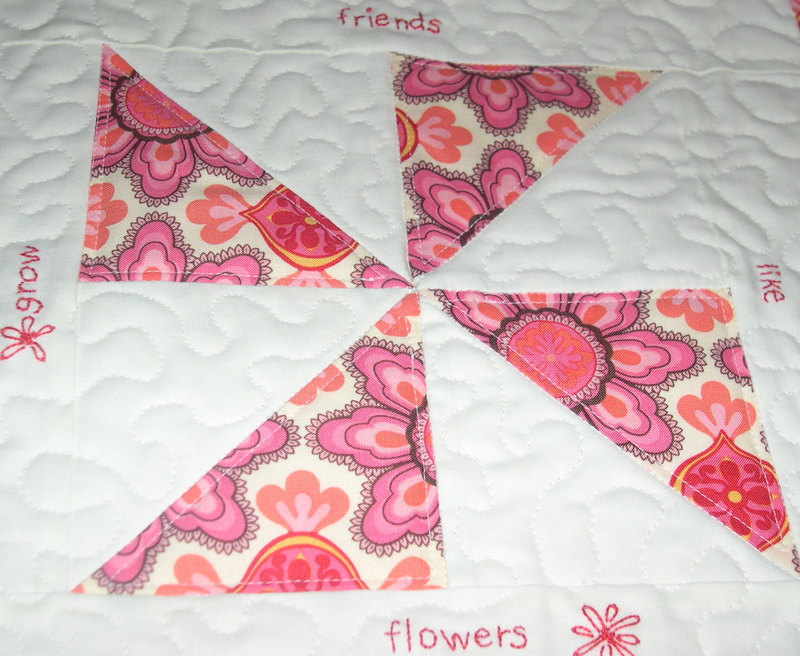 Love the pinwheel block – such a sweet sentiment. So glad you are blogging! I love your sewing, your recipes and the day-to-day stuff. It’s lovely! Pinwheels seem to be all the rage around blogland these days. Congratulations on your November blogiversary! 🙂 I love being inspired by your projects! Happy 300~! I love the inspiration from your blog! Congratulations!! 300 is really impressive!! Congrats, Terri! Blogland is a great place, isn’t it!? Thanks for your sweet comments on my post today. WOW. Two years and over 300 posts! I’m still a babyblogger 🙂 I’m not even at 50 yet! I’ve really enjoyed getting to know you through your blog and it always makes me smile to see your comments on my posts. (It’s nice to know someone other than my mother appreciates my efforts!) It’s a beautiful little quilt and I’m sure it will have a wonderful new home! Congratulations! No, thank you, Terri, for all you share with us! You are a generous and talented soul and an inspiration to everyone who reads your blog. We should all be sending you something!!! I would love to win the cute pinwheel quilt. Yipee and hooray! Congratulations on over 300 posts! You are such an inspiration and i always love visiting you here on your lovely space. 🙂 Oh yes i would LOVE to win a mini quilt. Your quilts are just sooo sooo gorgeous! Have a lovely merry happy day and love to you! Congratulations Terri! I love this quilt! I am so honored to have been your blogging friend, I have enjoyed coming to share your projects with you, and your input has been so valuable to me on mine. This is gorgeous! And I just love the sentiment. I am always thinking of starting a blog… and then I don’t. I am terribly impressed with all of your posts… and your creations! Congratulations, my friend, on 300 posts! Your work is beautiful and it’s been a pleasure to get to know you! Your pinwheel mini is so fun with the embroidery:) And your blog has a new look, too! I’m not entering, but just want to congratulate you on so many wonderful posts that are good inspiration for the rest of us! It is always a treat to see your blog in my RSS reader. We love these mini quilts around here. My daughters dolls have the best looking quilts around I tell you! I love the fabrics you worked with and think your have reached quite a milestone of over 300 posts/ 2 years!! congratulations. Keep up the good work, your spot is always an inspiration. Thank you so much Jenny for your encouragement! I used to make doll quilts when I was a kid, so I can relate to having those treasures. Thanks for stopping by to enter. Congratulations on over 300 posts!! Wow that’s a lot of posts. You always have great things to share. I love your quilt. Very clever! Keep on stitching. . . . . . .
Love seeing all your creativity! It’s almost as fun as a new fabric store!! Too cute! Love the embroidery. Congratulations on your 300th post! It’s so nice to have made such a great friend! Congratulations Terri, Wow 300 Posts, Woo Hoo!! It’s been so fun getting to know you better, seeing all of your beautiful quilting & sewing projects, your yummy baked goods and fabulous trips. Thanks for sharing!! I just hit 100 posts, Woo Hoo!! I would treasure your little quilt and hang it with my other mini’s, it’s adorable. Thanks for the chance to win. Just lovely. I especially like the sentiments you wrote. Woohoo. Congratulations on all your posts. Your blog is always so inspiring.